The Digital Age has produced a vast collection of apparatus which have improved the lot of the modern writer/publisher. It is now much easier to produce written works and photographic images of professional quality. But using the equipment can be exasperating. Manuals are complicated and gadgets that once worked well suddenly cease to function properly if accidentally damaged or software is upgraded. Most recently, the equipment pictured above has brought great despair to the smooth workings of Peatmore Press Limited. The pda is old technology and no longer synchronises with the laptop PC now that the operating system has been upgraded. 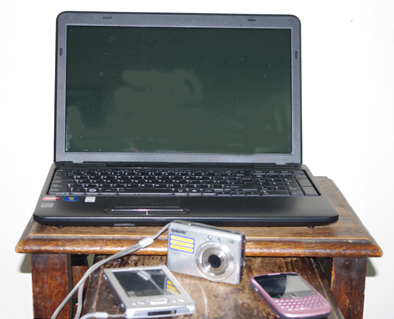 The mobile phone is also prone to fail to synchronise with both laptop and desktop PC for no apparent reason. The compact camera has been damaged by leaving batteries in it too long causing them to leak, corrode and jam the memory card inside. The problem with the pda has been solved by limiting its synchronisation use with the desk top PC which still runs on Windows XP and giving up using it with the laptop and its Windows 7 operating system. The mobile phone was sorted by removing the battery and rebooting it in much the same way as PC problems are resolved by switching off the power and turning it on again. The camera posed a different problem which has affected electrical equipment since the time batteries were first invented. An attempt to remove the corroded memory card using WD40 oil succeeded but ruined the camera as the oil penetrated too far into the mechanism. On the bright side, technology did come to aid as some of these issues were solved by typing the problem relating questions into Google. Unfortunately, it was too late for the camera. These gadgets can now be regarded in the same way as family — frustrating but indispensible. Books, cameras, music, watches, TV, radio, audio have all been revolutionised by digital technology. Reel to reel tape recorders, 35mm cameras, pen and paper still exist and are used less but will never die. Their legacy has been passed on to the digital age. Book publishing, recorded music, radio and TV were once the domain of the professional or the serious amateur enthusiast but not anymore. The analogue recording/film studio may be a thing of the past. Photography meant taking time to get the exposure right followed by many hours amongst chemical solutions, tanks and trays in a dark room. Not anymore. The new technology makes it is so much easier for anyone to produce work of expert quality. The artist is freed from having to translate his or work for the technical specialist and can take direct control.